Last May HEXUS reviewed the powerful compact Intel Hades Canyon NUC (NUC8i7HVK) which is based upon the Intel Core i7-8809G which combines a 4C/8T Intel i7 CPU with AMD Radeon RX Vega M GH (1,536-core) GPU on one SoC. The design was quite a departure for Intel NUC models to both emphasise the performance and tame the up-to 100W TDP processor under the hood. In August Intel launched the more 'traditional' looking code-named Crimson Canyon NUCs which are the first mainstream NUCs with discrete graphics. Now, according to reports, these mini PCs are going to be available shortly. In general computing tests it wasn't surprising that the 15W Core i3-8121U is "a bit slower" than the 28W i3 CPU in the Bean Canyon NUC. However, when it comes to gaming the reviewer found that the Crimson Canyon i3 NUC pulls ahead of the Skull Canyon NUC in gaming tests. In BF4, playing at Full HD, medium quality present this Crimson Canyon machine achieved min/avg/max frame rate was 48/54/63FPS. Sadly, only BF4 and Dirt 3 were tested on the NUC8i3CYSM during the gaming section of the review. Moving onto entertainment tasks, the reviewer points out that the Radeon GPU supports HDR and does hardware decoding of most popular formats – however, the Intel GPU might be better at VP9 decoding. 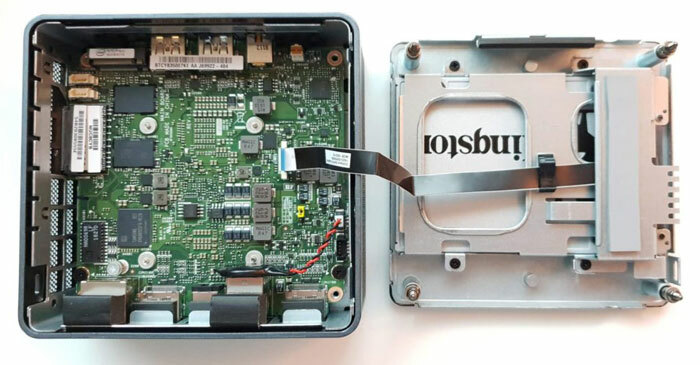 If you want something a bit more powerful in the CPU department, The NUC Blog notes that an i5 version of this machine, dubbed Islay Canyon, will be coming along later in the year. £495 as specced in the review. What on earth is it for? Someone that wants a tiny PC that… just about plays games? Business users and some home owners. Small footprint PCs with a bit of GPU umpf are becoming quite popular now. In fact, I recently had a big workstation tower on my desk replaced with an absolutely tiny Lenovo box and must say its been faster in every way and as quiet as a mouse…. Have you tried turning it on ? Not seeing the use case for these seems to indicate a lack of imagination, just on size alone. Not everyone lives in a large multi-room dwelling, and in 2nd and 3rd world countrys these may be a very adequate solution.